At the beginning of the year I made a last minute decision to help out a fellow vendor and create coordinating stationery for an industrial themed styled shoot located in a city near and dear to my heart....Louisville. As soon as Jessica, of Jessica Bradford Photography, told me the venue (O'Shea's) and vision for the shoot I was flooded with inspiration. 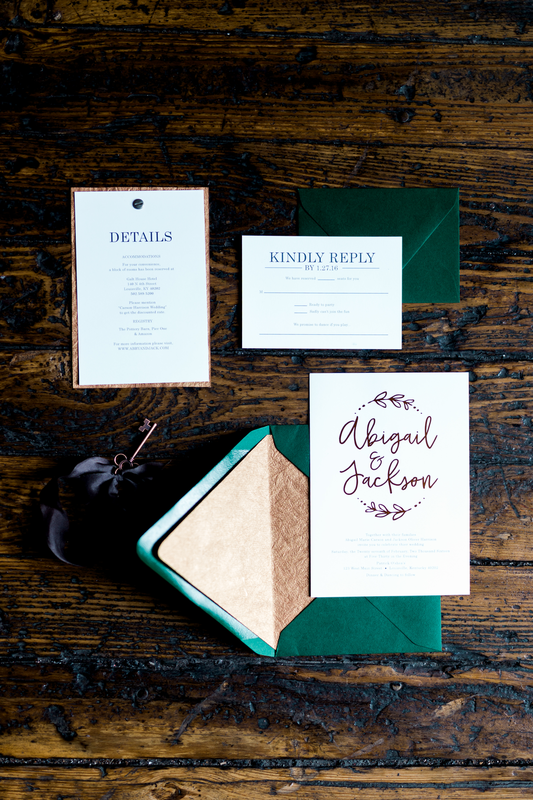 With an organic industrial theme in mind I went to work incorporating shades of green and pops of copper to create a swoon worthy suite. I couldn't wait to get these images back and Jessica did not disappoint. To see even more photography goodness be sure to check out our summer feature on Artfully Wed!